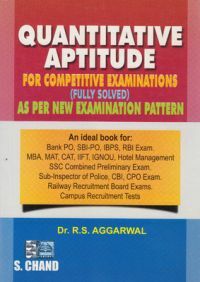 About the Author: R. S. Aggarwal is a seasoned author of competitive examination books, who was born in Delhi, in the year 1946. He is an alumnus of Kirori Mal College. He was a lecturer in Nanak Chand Anglo Sanskrit (NAS) College, Meerut, until he received a fellowship to pursue his Ph. D. in Delhi University. On completing his doctorate, he became a reader in NAS College and moved to MMH College in Ghaziabad. The author of 75 books has been voluntarily retired since 2003.